Santorini is known as one of the most romantic places with the most beautiful views but also not the most practical place to come with a baby. If you saw my post from last year, you know that we got to visit this magical city and yes, Linor came along! I ignored everyones warnings and decided to make it work and I was right because we ALL had an incredible time including Linor! 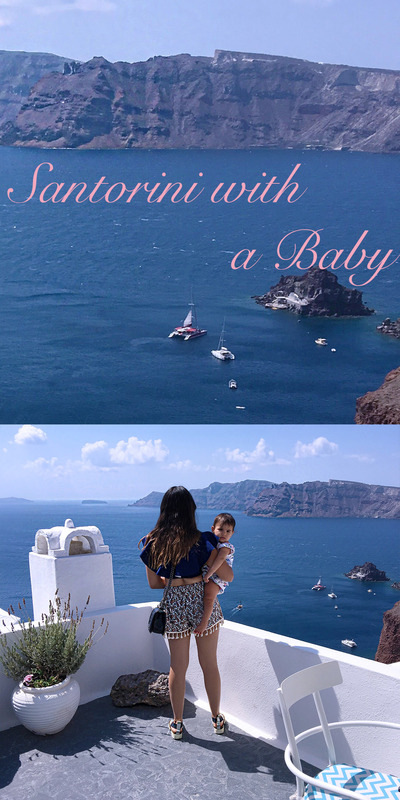 A year later and I am still constantly asked advice on traveling to Santorini with a baby. 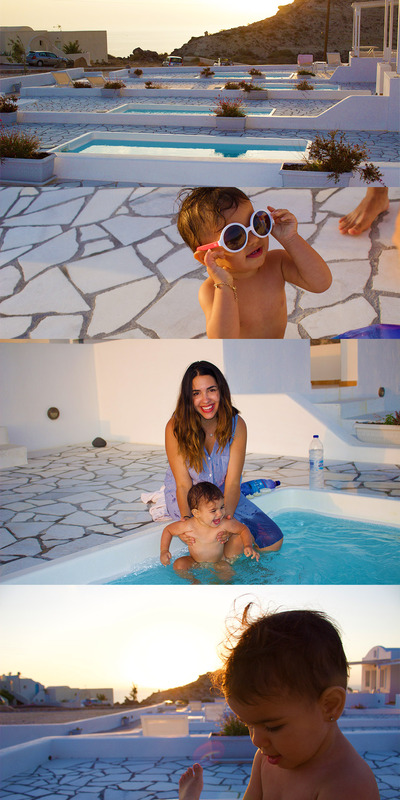 So here it is; ‘My ULTIMATE travel guide to Santorini with a baby! 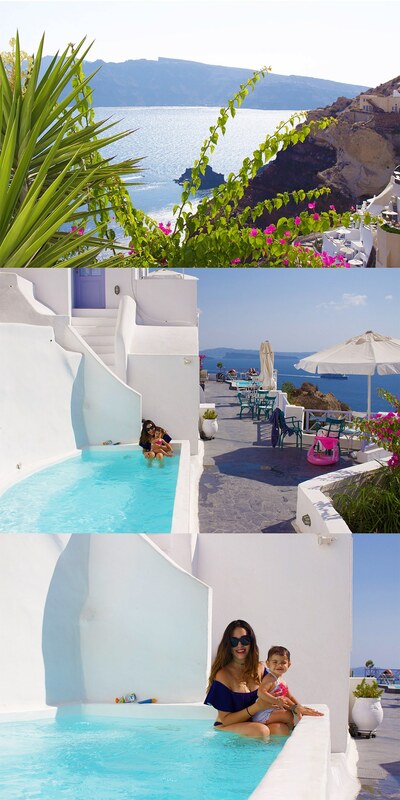 As I mentioned on my previous Santorini post, (read here) when you are choosing on a place to stay keep in mind that most hotels, especially the ones with a cliff view, do not allow children. We were supposed to stay in Santo Maris Luxury Suites & Spa hotel in Oia until I called three days before our flight to set up a crib for Linor. They then told us that they are strictly an adults only hotel and we had to change our plans last minute. Keep in mind that we did book via KAYAK and I did filter that we were ‘2 adults and 1 child under 1’ and this hotel still came up; so I highly suggest calling the hotels before to double check! We were forced to book last minute because of the delay and searched every option. Most hotels were either booked or again did not allow children. We then came across Katharos Villas in Oia which is a modern and chic boutique hotel and is very ‘family friendly.’ Every room is like a mini apartment with a personal pool and fully equipped kitchen. The location is also ideal with only a few minutes between the center of Oia and the beautiful Ammoudi bay which offer many delicious restaurants. 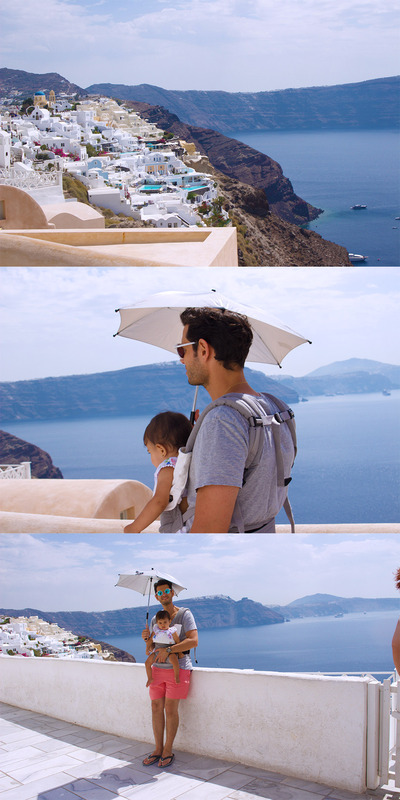 When walking around the heart of Oia we came across many beautiful hotels and couldn’t help but ask some if they would allow us to stay there on our last night since Linor wasn’t even walking and was mostly being carried. Most didn’t all0w until we came across the Armeni Village who said they would make and exception. Armeni Village is located in heart of Oia on the edge of the Caldera and the view is absolutely breathtaking! Again, I do not recommend booking without asking first because it could be they just made a one time exception! Sunscreen and Umbrella: With high elevation the sun was very strong and of course dangerous especially for babies. Sunscreen was a must but we also brought a little umbrella to walk around with for extra protection. I would say we were being over paranoid but then we did bump into another family who’s poor baby got a horrible burn and they did use sunscreen! Baby Carrier. We actually took out our stroller our first day in Oia until we realized it was a complete mistake! There are many steps and we found ourselves carrying Linor most of the time unless we were at a restaurant. For the rest of the trip our stroller was in the hotel and we took out our baby carrier! 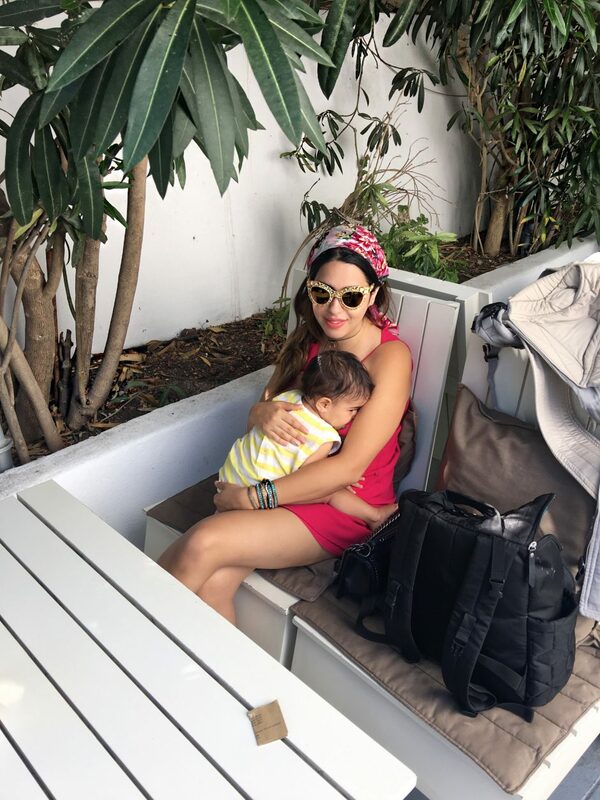 We had the ergo baby carrier which is super comfortable for both baby and mama- Linor even took her naps in it! Car Seat: I highly recommend renting a car for at least part of your stay especially if your looking to explore different parts of the city. Car services and taxis I encountered are very expensive and do not have car seat options so highly recommend bringing your own car seat. Black Beach: We sat to eat lunch here in an amazing restaurant called, Sea Side. You also have the option to rent a cabana by the beach if you are planning to spend the day here. We then visited Akro Beach which was almost like a secluded side in Black Beach and was very beautiful with good music, drinks and even massages. Red Beach and White Beach: The only way to visit white beach is by boat we got to see it from far view but could not get to it. The same goes for Red Beach if you are traveling with a baby because the hike was steep and seemed dangerous to do while carrying Linor. Santorini was such a magical place to visit and I am so happy we got to experience it together as our first family vacation with Linor. Of course, it would’ve been a different experience just me and Roy, but we really had an amazing time. Keep in mind that Linor was only 10 months old when we came here and she was not walking- I do not recommend coming here once your baby is starting to walk for safety reasons. I hope this guide helps and if you have more questions don’t hesitate to ask!